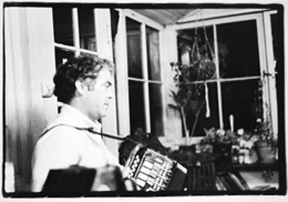 This site contains numerous field recordings made in the early 1970s of the great Irish accordion player Joe Cooley when he lived in the San Francisco bay area. The recordings were made on a Norelco cassette recorder by Jeremy Kammerer and Cathie Whitesides. The photos here of Joe Cooley, and the one below of Kevin Keegan, were made by Eric Thompson on the porch of the legendary Colby Street house in Berkeley, CA. The recordings have been digitized into separate mp3 files but otherwise not edited or processed, and there is a lot of variation in volume and quality. The tunes can be streamed individually, or the entire collection and notes can be downloaded in a zip file. Joe Cooley was born in Peterswell, Co. Galway in 1924. 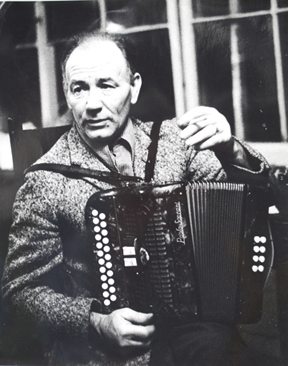 He influenced an entire generation of musicians and music-lovers with his powerful, clear, passionately joyful and unique way of playing Irish accordion � or as Joe called it �the box�. 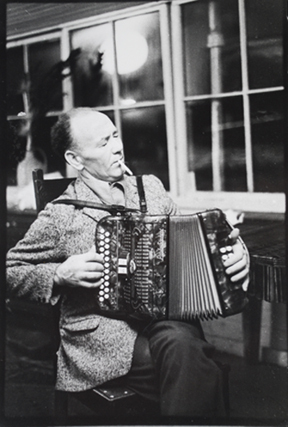 An excellent CD �Cooley� can be found on Gael-Linn CEFCD 044 compiled by fine accordion player Tony MacMahon. There is ample early history there about Joe and the history around many of his signature tunes. Joe emigrated to the US in 1953, having already established a distinguished playing career with the Tulla Ceili Band and many other fine musicians. The recordings here were made by me or Jeremy Kammerer on his Norelco tape recorder from about 1970 to 1973 with an understanding with Joe that it was ok to record but not to be too obtrusive about it. Mostly I operated the recorder because Jeremy was playing banjo. We were also given a few cassettes and one is included here of Joe playing with Miliosa McWeeney Lundy on banjo, a fine musician living in Oakland, CA, then from Los Angeles and used with her permission. I first heard Jeremy Kammerer, Eric Thompson, and Jody Stecher play Irish music at the Dickens Fair in 1970. I then met Joe Cooley through Jeremy, who had met Tony MacMahon in Ireland in the �60s. Tony told Jeremy to look up Joe when he returned to San Francisco. Jeremy looked up �Cooley, Joe� in the phone book, called him up, and after explaining his enthusiasm for Irish music, Joe said �It sounds as though you�d be great at it!� Joe and Jeremy met across a wide cultural divide. Joe was able to look beyond the long hair and absence of obvious employment and appreciate our love of the music. Joe began inviting Jeremy and friends including myself and others over to his house on Tuesday nights after Patricia Kennelly�s accordion lesson for some tunes, a beer and some of Nancy Cooley�s fine cake. Joe charmed us with so many stories of home and one, the hunting of hedgehogs, was so interesting that when we needed a band name Eric Thompson, lifelong fan of Pogo, hit on the hedgehog -- �graineog� as we understood it and suggested �The Graineog Ceilidhe Band�. It didn�t have the proper geography of �The Tulla Ceili Band� (Joe�s band) or �The Augrhim Slopes� (Kevin Keegan�s band) to Joe and Kevin. When pressed Joe told us the hedgehog was �just the warmest, furriest little creature�. The less fine aspects of the �graineog� became a twinkle in Joe�s eye. But nevermind, there began a glorious decade with Jeremy where we dropped everything and began to learn the tunes and social mores around Joe and his good friend Kevin Keegan, another splendid box player. We saw them weekly, daily if possible, recording, practicing, coaxing when the tunes were too hard. We practiced by busking, and shortly found ourselves with many fine pals playing Irish music at Freight and Salvage Coffee House, Dickens Fairs, Renaissance Faires, newly opened pub The Starry Plough in Berkeley, and then the Plough in the Stars in San Francisco, and innumerable parties. Everybody who happened to be along learning the tunes was �in the band� and sometimes we numbered in the 20s or more, sometimes trios or quartets. Joe would sometimes ask if the recorder was on before he started because he knew we were learning these tunes as fast as we could get them. Mostly he ignored the recording aspect and we never discussed with him what might happen to these recordings later. It never occurred to us. The recorder sometimes starts after the tune has begun, sometimes breaks off, the tunes flash with sublime brilliance and the odd missed note here and there. We recorded under every circumstance from intimate visits at home to big parties or pub sessions and everything in between. Joe was a consummate dance musician as well as accompanist when wanted. Some of the recordings have audible dancing. He played at many feis competitions, and we recorded everything we could get. He told me that what was actually important in music was �the sunshine between the notes.� We were happy. What we didn�t know is that as Joe began to contract the illness that killed him, he was less and less up for sessions. He still played with us and for us, but would get part way through a tune and put the box down. We left the states in the fall of 1973 to go to Ireland where we�d heard Joe was headed but we didn�t know how ill he was. We thought we�d go via Japan, since we knew if we went east we�d end up west. We played music to survive and eventually taught English for 6 months. We had no idea how quickly our funds would disappear or how hard we would need to work to end up in Ireland a year later. To our great sorrow in December 1973 Sue Thompson and other friends wrote to tell us Joe had died. Jeremy and I have determined now late in our lives that sharing this music is better than not doing so. Wish we�d done it decades ago but we met with a variety of opinions on this plus our own inertia and activity staying alive slowed us down greatly. My hope is that people will participate in feedback, tune names, corrections, important things to add, and receive this gift in the spirit it is given. It is entirely our gift no strings attached. Tunes are in mp3 format. We have much more information and some wonderful stories about Joe, if anyone is interested just write. We�ve gotten a lot of help particularly from WB Reid with digital work and cataloging, Hilary Hart, Sue Thompson, Eric Thompson, Will Spires, Joe Murtagh, Sean Sullivan, Chuck Pliske, Hank Bradley, Jody Stecher, Dan Tenenbaum and lots of others and if I left someone out I apologize. None of this would have happened without Jeremy Kammerer.